Matt is away for a week due to work so I am left to fend for myself food-wise. After two straight days of Chipotle and McDonald’s, I was craving homemade food. Short of bribing my friend, Heather, to come cook something for me, I would have to bite the bullet and venture into the kitchen (other than to feed the cats or grab a cold Diet Coke). I decided to start simply: eggs and home fries. Both eggs and potatoes are cheap and I could always have instant oatmeal for breakfast if it didn’t turn out. All in all, I think it was a success. One of the egg yolks was pierced and the home fries didn’t quite get crispy, but it’s sure better than instant oatmeal! I love chicken. If I want to order a meal with meat, I almost always choose chicken. My favorite is chicken breast. Too bad most restaurants (and home cooks) overcook them. while looking through one of our cookbooks I found a recipe for Parmesan-Dijon Chicken. Chicken breasts are coated in dijon mustard then a Parmesan and breadcrumb mixture then baked. 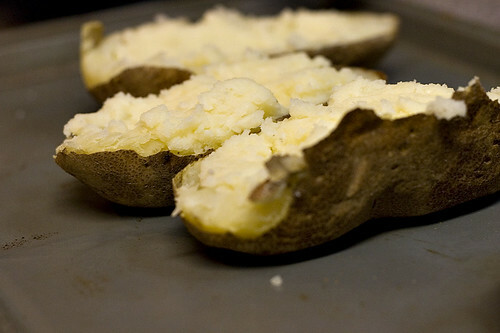 The recipe suggested Twice-Baked Potatoes as an accompaniment. Perfect. I love twice-baked potatoes and they seemed easy enough. 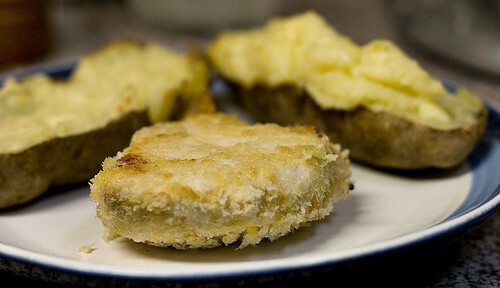 Bake potatoes, remove inside, mix with cheese, put back into potato, and heat through. The chicken turned out moist (benefit of cooking to temperature instead of time) though all of the breading sort of fell off. Next time I’ll use a more typical flour then egg then breadcrumbs approach. I’ll also add a bit more dijon as the taste didn’t really permeate the chicken. As for the potatoes, they were just about perfect. Using a food mill to mash the potato and heavy cream (in place of the suggested milk) created a fluffy filling. If you make these, be sure to be certain not to ruin the structural integrity of the potatoes as much as I did. Mix mustard and melted butter into shallow container. Place Parmesan and bread crumbs in another, similar container. Coat chicken in butter/mustard then Parmesan/bread crumbs. Place chicken in shallow baking dish and cook for 20-30 minutes at 375 F. If you’ve got an instant-read thermometer, use it to cook chicken to 160 F.
Poke holes in potatoes and cook for 1 hour at 375 F.
Scoop meat from potato (leave enough so it doesn’t fall apart). Mash potato and mix with butter, cream, and cheese. Put mixture back into potatoes. Bake at 375 F for 20 minutes. So, what to pick for my first recipe. I don’t want to choose something too easy (lasagna) or boring (breaded chicken breast). I thought of what I ate growing up: hamburgers. Every single time I went out for dinner at a new restaurant, I’d get a cheeseburger. I still love ’em to this day. Perfect first dish. Consulted my books. Betty Crocker told me I could grill, broil, or pan fry my burgers. No place for a grill in our balcony-lacking 2nd floor apartment. Pan frying – eh. Broiling them would make me face my fear of the oven (once got burned pretty bad taking a cake out of the oven – been scared since). Julia and Alton didn’t present any other methods, just elaborated on them a bit. Betty thinks burgers should be broiled 6″ away from the element for 6 minutes per side. Julia, on the other hand, thinks broiling should only be chosen when it’s possible to cook the burgers one inch away from the element for a minute and a half per side. After a little measuring of our broiler’s three levels (3 1/4″, 4 3/4″, and 5 1/4″ from the element) I decided to trust Julia and her 1″ 1.5 minute combination. If making my first non-boxed, non-canned, non-frozen, non-delivered meal in my life wasn’t hard enough…Matt had me grind the burger myself. It’s not all that hard but part of me really wanted to just grab a pound of ground chuck at the local butcher shop. But, I’ll admit, he was right. 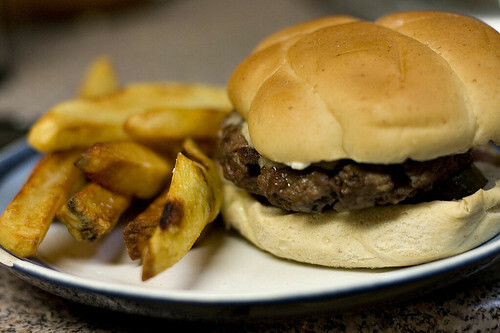 The burgers turned out really juicy though I think I’d prefer them to be a little more cooked through and browned. 1. Place broiler pan/tray on top rack of broiler. Turn broiler on. 2. 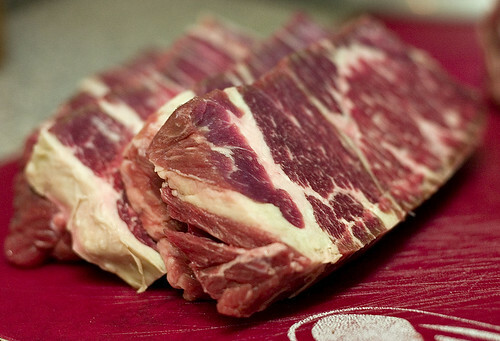 Cut meat into 3″ x 1″ by 1/2″ strips (small enough to fit into meat grinder). 3. Grind meat, alternating between fattier and leaner strips. 4. Salt and pepper ground meat as needed. “As needed” means more than you think if you have no sense for these things and less than you think if you do. 5. Form patties 3/4″ thick and approx 4″ in diameter. Make small indention in center to assure flat patties post-cooking. 6. Place patties on broiler pan/tray and cook 2 minutes per side. If adding cheese, add one minute before burgers are done. Despite anything you may have read, I am far more than a picky eater. I am a student, a knitter, a robotics mentor, and someone who cannot cook. Sure, I can zap a mean frozen pizza and Google-411 a Cambodian/Thai restaurant like nobody’s business. But actual cooking. Eh. Growing up, my parents switched off cooking meals for our family. Despite some great dishes (meatloaf and cordon bleu come to mind) neither parent really loved to cook. That’s not to say they didn’t pass any knowledge of cooking onto me; I still add a little milk when making scrambled eggs and a homemade burger must have Old Bay and be of a more spherical rather than flat patty shape. Then I met Matt. He decided to teach himself to cook in order to impress me. I still remember sitting in his college apartment, eating chicken fetticini alfredo he’d made especially for me (and his roomate, Alex, joking that he’d had better). Now we have a home with 30 cookbooks, hours of Tivo’d Molto Mario episodes, and way more kitchen gadgets than I knew existed. It’s time I caught up. Starting today, I’m going to learn how to cook. No fancy classes. No lessons from Matt. Just me, some introductory cookbooks, and a kitchen full of pointy objects and raw ingredients. It’s going to be interesting. As I’m basically going to be teaching myself from books, I had to choose a few to use. 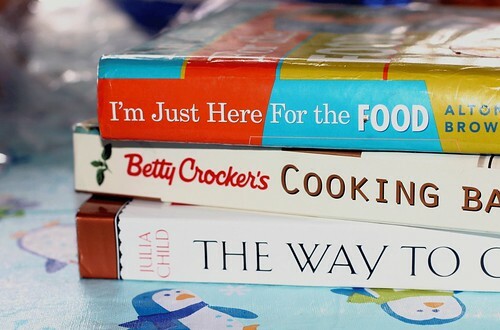 My guides will be Alton Brown’s I’m Just Here for the Food, Betty Crocker’s Cooking Basics: Learning to Cook with Confidence, and Julia Child’s The Way to Cook. I’ll mainly use Cooking Basics as it assures you’ve never seen a teaspoon and find boiling water a challenge. While I bow down before Queen Julia and find a geeky pleasure in Mr. Brown’s writing, they will be relegated to positions of reference.